XJ700R LFE Mono Block Class J Amplifier - Powerful and easy to use. 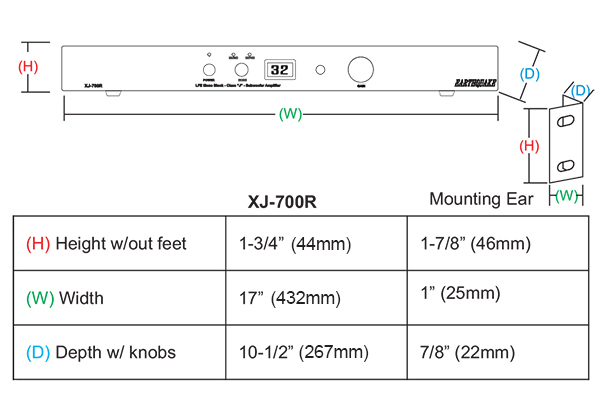 The XJ-700R is a high power mono block subwoofer amplifier ideal for powering large subwoofers or tactile transducers. Featuring advanced Class J output technology, VE-TAT acceleration and MARS protection - all in a cool running fan free 1U package. Sporting 700/400 WRMS into 4/8 ohm, the XJ-700R is ready to power your low frequency needs. The XJ-700R has optimized presets for movie/ music listening, a digital volume readout with rotary dial and remote control. Features include : variable low pass filter, phase inversion and precalculated boundary EQ. 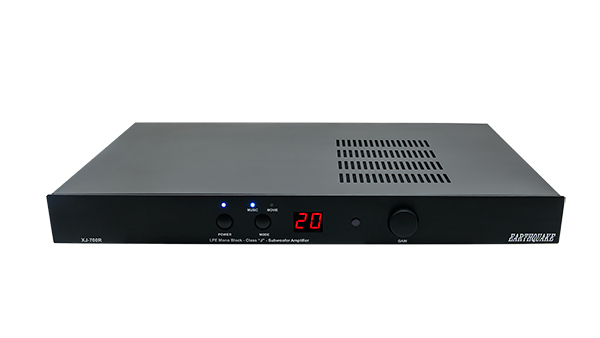 The patented Class J output stage ensures stellar audio quality and takes the concept of the “intelligent circuit” a step further by actually adapting the electrical operation of the output stage to the signal it is playing. This can rightly be considered a quantum leap in amplifier technology. The revolutionary aspect of Class J is its ability to combine ultra high efficiency of 99% with extraordinary bass control. Class J is an evolution on PWM (Class D) technology that combines advanced multi-level digital feedback with an intelligent controller. It modulates the supply voltage and output switching frequency in real time based on the frequency and amplitude content of the input signal. This added level of intelligence offers several advantages such as increased thermal headroom, dramatically improved bass response and dynamic power capabilities. VE-TAT (Velocity Enhancing Transistor Augmentative Technology ) is an enhanced transistor dead-time controller. Where Class J is an intelligence infused output topology, VE-TAT works at the component level. A critical area for efficiency in a PWM (switching output) amplifier is the speed and precision by which the transistors can be opened and closed. VE-TAT dramatically increases transistor velocity thus eliminating dead-time losses and increasing efficiency. The internal communication of MARS transmits in the optical plane with a speed more than 1500 times that of the fastest signal passed through the amplifier. MARS does not use any relays or other damping-factor reducing mechanical switches that can wear out or fail over time. Instead, a specially designed circuit instantly shuts off the output drive. 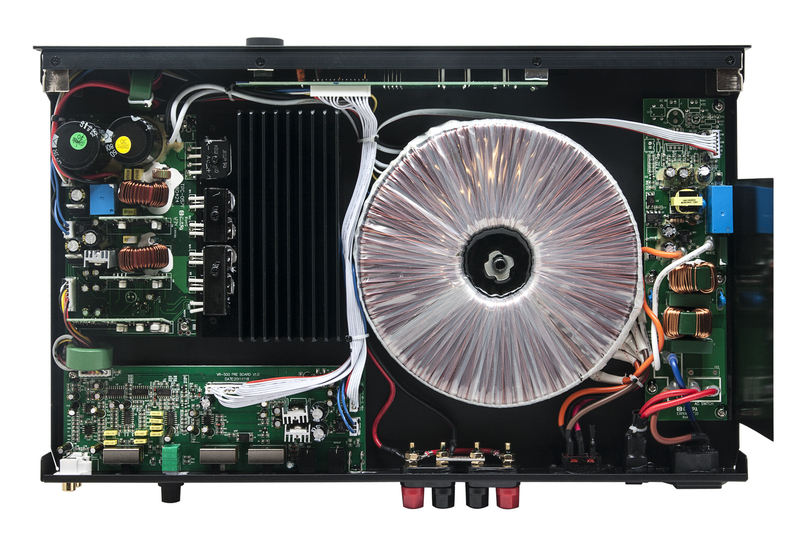 The patented technologies combined with a dramatically oversized power supply make the XJ700R amplifier capable of delivering raw quantities of continuous power. The power supply is based on a rigid silicon-steel, hard-wound Pancake low regulation 1200VA toroidal transformer. The large and heavy transformer ensures a stable supply without voltage drop even at severe and continuous operation. Note: The minimum rated impedance is 4-Ohm total. On the actual amp it specifies 4-Ohm minimum on each terminal. These terminals however operate as one, meaning that you can either put a 4-Ohm load on one of them and none on the other OR put an 8-Ohm load on both of them, resulting in a total impedance of 4-Ohm.